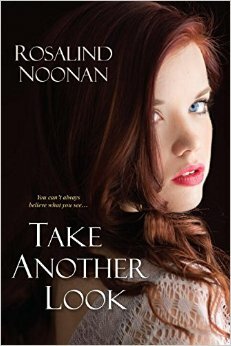 This latest thriller from Rosalind Noonan had me hooked from the very first page. From the opening scenes until the conclusion, I simply could not tear myself away. It starts off as sort of a “What would you do?” When Jane finds herself pregnant with twins and in an unhealthy relationship, she makes the heart-wrenching decision to give one of the babies up for adoption. After struggling with just which twin to keep, she makes peace with herself and her choice. She moves away and starts a new life with baby Harper. Several years later, her past comes back to haunt her when she unwittingly comes face to face with her long-lost daughter, Isabel. Everything she’s struggled to build for both herself and Harper is threatened when she must ‘fess up to Harper. As if that wasn’t a hard enough task, Isabel’s arrival coincides with some strange happenings. Accidents, missing items, illnesses, truths disguised as lies…Jane doesn’t know who or what to believe. Are these just more of Harper’s typical teenage dramatic outbursts? Or is something more disturbing at play? This is one of those stories where you might think you know what’s going on. I thought the same thing. And I was right. Partially. It’s a book that leads you on and keeps you guessing. And even when you’ve got it figured out, it’s still one heck of a story!